Map of defenses of Petersburg, Virginia, showing the position of General Lee and his staff during the attack on Fort Stedman, March 25, 1865. This is a manuscript map of the eastern front of the Petersburg defenses, produced by Federal topographical engineers and surveyors shortly after the end of the war. It depicts the area south of the Appomattox River, north of Baxter Road near the Crater, east of Jerusalem Plank Road, and west of the main Federal line of siegeworks. The X marking the location of General Lee and his staff was secondary to the purpose of the map, which was to capture in detail the Confederate defenses. Many detailed maps of Federal defenses were produced during the war. Confederate defenses, on the other hand, could not be mapped until they were evacuated for obvious reasons. 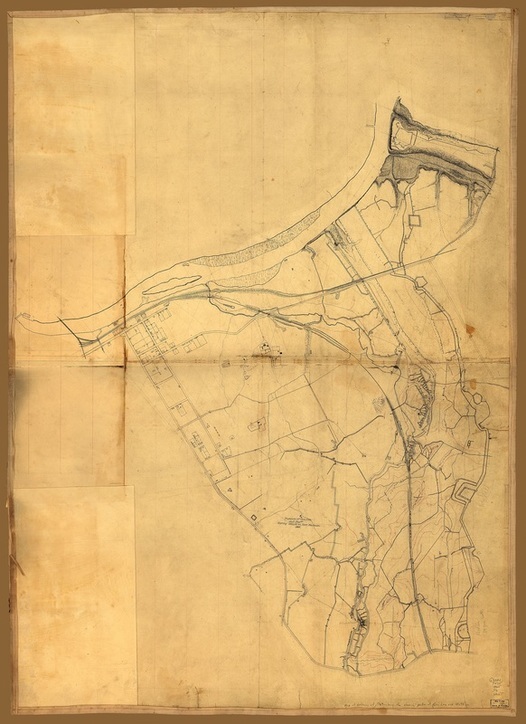 This is one of a number of preliminary maps that were incorporated into an 8 inch = 1 mile map series that covered the areas of Petersburg and Richmond in 28 sheets. This series, compiled under the direction of Nathaniel Michler, is found at NARA RG77: G 204-33 through G204-60. Most preliminary sketches appear not to have survived. We are pleased to have this one as it shows details that are not found elsewhere.